One challenge of a sensing technique is reducing sensing time while ensuring good effective data rate. In fact, once compressive sensing based on sub-Nyquist sampling is adopted, sensing time can be reduced by saving number of samples. This increases the probability of missed detection which causes collisions with primary service and worsens channel imperfections. In such case erasures occur in addition to errors. In this chapter, the authors propose a new technique to correct erasures while keeping sensing time at a desired level. Based on polar code and low complexity decoding algorithm, the proposed technique exhibits for high code rates better performance in terms of bit error rate (BER) compared to two existing techniques based on other codes, namely low-density parity check (LDPC) and BCH. Electromagnetic spectrum is a scarce natural resource that needs to be managed. Cognitive radio (CR) is believed to ease congestion and overcome underutilization of the usually called spectrum. However, designing CR networks faces some challenging issues, such as spectrum sensing (SS). SS is a process of identifying the spectrum status for self-usage. The critical function of SS is required to identify spectrum status and to determine if the spectrum allocation satisfies the quality of service (QoS) requirements of all users. Generally, detection performance is characterized by false alarm and missed detection probabilities. False alarm occurs when the SS inaccurately detects primary users. Missed detection occurs when spectrum holes are detected. Moreover, in case of missed detection, this may cause collision between the primary and the secondary transmission. SS techniques are indeed not perfect. When SS fails, it not only causes collisions, but also increases the error rate. Such imperfections can be handled either by using channel coding techniques, or increasing the sensing time. Both of the methods result in the reduction of effective data rate for secondary users. One can say that increasing sensing time enhances detection, whereas time resource is limited and shared by SS and data transmission. Since the sensing time determines network responsiveness and performance, thus it is necessary to reduce it as minimum as possible. However, reducing sensing time increases collision probability, which causes erasures and data loss along the secondary user bit stream. Thus, to counter such effects, the secondary receiver can employ channel coding technique while maintaining a desired sensing time. To optimize the performance of the secondary user (SU) without incurring undesirable collisions, one may use as the constraint for ensuring protection of primary users (PU) while setting as the optimization target to ensure maximization of spectrum reuse by secondary users (Lin, Liu, & Hsieh, 2013). Such problem can be formulated as follows:Minimize Pf, conditional on the constraint of (1) where is the desired threshold for PU protection. (2) where is a sampling frequency and is sensing time. Obviously from the Equation 2, increasing parameter increases sensing time, which affects network responsiveness and performance. Nevertheless, decreasing worsens sensing imperfections. At given SNR, authors showed in (Benkhouya, Chana, & Hadi, 2016) that there is an appropriate such that no more samples are required to verify the Equation 1 above. If is denoted the value of for which , then is the number of saved samples. Authors proved that for the CS deployed, there is a time reduction corresponding to . Since the sensing time is now reduced, this causes erasures and channel coding techniques should be adopted to tackle these defects. BCH: The BCH codes or Bose-Chaudhuri-Hocquenghem codes, part of cyclic codes, are constructed using polynomials over a finite field. Binary BCH codes were first discovered by Alexis Hocquenghem in 1959. AWGN: Additive white Gaussian noise is a basic noise model which is often used as a channel model. Cognitive Radio: Is an emerging technology to deal with spectrum scarcity and also a way of improving spectral utilization efficiency. 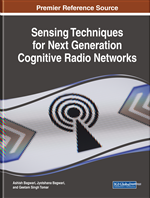 Cognitive radio enables the use of radio spectrum that is underutilized due to the fixed allocation of frequency bands. GF: Galois field, so-named in honor of Evariste Galois, is a field that contains a finite number of elements. Multicoset: is a sampling technique which is more suitable for practical implementation in comparison to more sophisticated sub-Nyquist systems. Based on the prior information on the number of narrowband channels, multicoset sampling is applied to each secondary user by taking non-uniform samples at the time instants , where , and is the Nyquist sampling rate. The set , which comprises of distinct integers chosen from is referred as a sampling pattern. Rayleigh: Can be modeled by generating the real and imaginary parts of a complex number according to independent normal Gaussian variables. LDPC: Low-density parity-check code, is a linear error correcting code. LDPC codes are also known as Gallager codes, in honor of Robert G. Gallager. Polar Code: Is a novel channel coding scheme that provably achieves the capacity of memoryless channels with low complexity encoding and decoding algorithms. Spectrum Sensing: Implies a continuous survey of the status of the channels. Spectrum sensing plays a key role in detecting the holes or vacant channels.